Versa-Matic N25 1″ full flow high pressure pumps offer enhanced power when pressure and flow rate are important. Versa-Matic N25 high pressure pumps achieve discharge pressures up to 238 psi using two air chambers to double the amount of air per stroke. 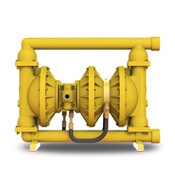 Included in the full flow design is an additional air chamber to provide higher flow rates with less pulsation, resulting in reduced wear on pipes and fittings. Click here for Versa-Matic N25 1″ High Pressure Double Diaphragm Pump detailed specifications.